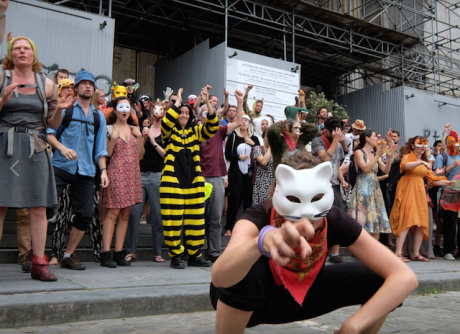 EZLN - Ensemble Zoologique de Libération de la Nature, November 9, 2017, Brussels. Some rights reserved.On November 9, nine citizens were summoned before a Brussels tribunal for a peaceful action to denounce the European lobbies of the agro-chemical sector and their overweening influence in the EU negotiations on the ban on glyphosate, a carcinogenic pesticide notably commercialized by Monsanto. The report by the NGO “Corporate Europe Observatory” shows that these lobbies of the agro-chemical sector have been particularly active in the debates during the last 6 months. A bunch of Belgian activists decided to face down the powerful lobbies through symbolic non-violent actions. Their affinity group was named the "Zoological Assemblage for the Liberation of Nature", better known by its French acronym "EZLN" in a clear reference to the Mexican Indigenous rebel “Zapatista Army for National Liberation” that has the same acronym in Spanish (“Ejercito Zapatista de Liberación Nacional”). While the context and the causes are much different, the Belgian EZLN activists have been inspired by the Mexican rebels. They borrow the poetic language of their communiqués, as well as their determination in the struggle from below against those in power, building from below “a world in which many worlds fit”. On March 9, 70 activists held a hilarious action denouncing the power of these lobbies. They entered the corridors of the European Crop Protection Association’ headquarter in Brussels, disguised as animals with the ecological slogan "We are the nature that defends itself". This 5-minute tour of the building left some straw, stickers and some red water paint on the windows, but nothing was broken. Eight months later, nine of these activists faced trial in the main tribunal of Brussels. The action of March 9 was part of various smaller actions by the EZLN to place the blame squarely on commercial lobbies and transnational corporations for major damage to nature. Similar affinity groups are active in Brussels and across Belgium against advertising billboards and against repressive Belgian policies against refugees and migrants. Overnight between November 6 and 7, they replaced 2100 advertisements in public spaces with posters denouncing an oppressive migration policy and calling on citizens to wake up to these unfair policies. The court summons these citizens received for a few splashes of paint on the facade of this powerful lobby’s headquarters illustrates the increasing criminalization of protest and symbolic direct action in Belgium. Similar trials are under way against "voluntary mowers" of GMO cereal fields and for the hijacking of one advertising screen. Intellectuals and numerous environmental and citizens’ associations have publicly supported the EZLN and legitimized this action by pointing to the consensus among independent scientists on the threat posed by glyphosate to the health of the European citizens. Beyond individual citizens’ health, the health of European democracy is also at stake in a battle against one of its main enemies: the lobbies. As headquarter of the European Commission, Brussels has become the world capital of lobbies. It houses more lobbies than Washington and its rules are far more permissive than the regulations of lobbies in the US. The anti-lobby NGO “Corporate Europe Observatory” publishes a “Lobby Planet” guide of Brussels that is at least as informative as its famous model the “Lonely Planet”. So far, Belgian citizens and policy makers have barely reacted to this situation. The direct action by the Brussels’ EZLN and the subsequent trial have eventually attracted some attention to this issue. They raise major questions for our democracy: In what kind of society or political regime do we live, when whistleblowers on their toes face trial for non-violent action to denounce the power of lobbies? Is it reprehensible to point at the lobbies or is it a citizen's duty to draw the attention of policy makers to the threat they have posed to our democracy? The history of social movements teaches us that symbolic and non-violent action has been a particularly effective mode of action to denounce unfair political or social conjunctures. Such "disruptive acts" aim at breaking the political routine, sparking debates, triggering the population to act on a major issue that is little debated in society and asking policy makers to position themselves in front of this problem in order to progressively adjust the balance of views and set up new regulations. On December 1, 1955 on a bus in Alabama, an Afro-American student refused to cede her seat to a white man, as the law ordered at this time. Her action sparked a huge debate and boosted the civic rights movement that eventually led to the racial segregation laws in the United States. Who would condemn Rosa Parks today? Her action was clearly illegal but her statue now sits at in the heart of the US Capitol in Washington. 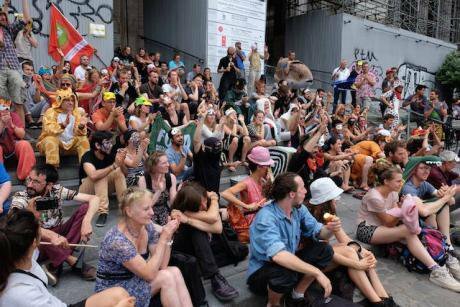 Pointing at the power of lobbies in the European Union, the EZLN plays a key role in our democracy. They are part of this "alert system equipped with antennae highly sensitive to the problems of society" that Jürgen Habermas placed at the heart of the democratic public space. John Keane explains that the monitoring of policy makers is even more central to contemporary democratic regime than fair elections. Such symbolic actions are efficient when they are combined with solid reports and analyses by civil society experts, researchers and journalists. The EZLN aims at broadly disseminating a range of reports available on lobbying and lobbies at the heart of the EU. In the last couple of years, dozens of articles, books and reports have unveiled scandals connected to the influence of lobbies on a wide range of issues. Together, they show that, rather than marginal dysfunctions, lobbies are often at the core of political systems, both at the EU and at the national levels. In their bestseller “Lobbykratie”, journalists Uwe Ritzer and Markus Balser show how German policies are built under constant monitoring and pressure by the industrial sector. They notably document that, on various occasions, the proximity between industrial lobbies and political power has led to some noticeably sudden adjustments by Angela Merkel during negotiations at the European Council. Has the European Union become a "lobbycracy"? The threat of lobbies against democracy is certainly exacerbated by the rising concentration of wealth in the hands of a few in a world where the turnover of some transnational companies is higher than the GDP of entire countries. The power of lobbies is not inevitable. Policymakers have the ability to regain the power they left to the lobbyists. However, they won’t impose new regulations on lobbies without citizens’ mobilization and an awareness of the issue among public opinion. The hilarious actions by the EZLN (in its Brussels version), invite all of us not to remain passive in one of the most fundamental battles to defend democracy in the 21st century. Animal parade. EZLN. Some rights reserved.